Looks like an M&P, with no rails. Pocket 9 sized. Maybe even single stack. Called it. That’s it. Got a pic this morning. I hope it’s a Double Stack that takes the same mags as the Full Size Models, like Glock has been doing for Decades. But I’ve never liked having to go the “Mix and Match” route with different Ammo/Magazines when carrying a BUG. YMMV, of course. I’ll see if I can get some pics at the NRA convention later this week, Unc. Hopefully it’s a thin, single stack 9mm roughly the size of the G36. If so, I’m in. 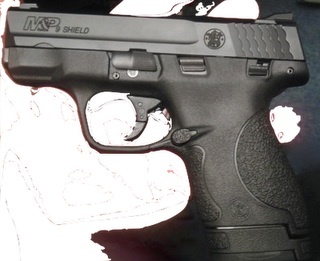 Oh, goody — an M&P SMALLER than the 9c. Just what I’ve always NOT wanted. So the new, new, Chief’s Special? A snub-nose Smith? Who would a ‘thunk it? Just what is needed from Smith as the competition has them and I want one. What I did not like about the others I do about this one. First one I see is mine.